Comprehensive review of LilyAna Naturals Retinol Cream. See how this retinol cream compares against other wrinkle creams! LilyAna Naturals Retinol Cream is a pretty good retinol cream for someone looking for extra hydration and plumped skin. The feeling of this product is thick and creamy and goes on the skin like satin, making your skin feel extremely soft and hydrated. It’s really easy to apply, and just one pump will cover your entire face and neck despite the thick consistency of the product. I noticed a big difference just a few days after using this product in the hydration and redness of my skin. My skin was feeling so soft and plump and the redness in my skin had seemed to calm down. I was surprised at how quickly I saw results! Unfortunately, over time there weren’t any more exciting results. I thought because I was seeing such immediate results this cream would make a big impact on my lines and wrinkles but the only difference I continued to see in my face was that it was feeling and looking hydrated and plump. Overall, LilyAna Naturals Retinol Cream works great to help hydrate and plump the skin, and to reduce redness, but it doesn’t work great for targeting fine lines and wrinkles, and helping with antiaging as a whole. LilyAna Naturals Retinol Cream is thick and creamy in texture and feels satiny and smooth on the skin. The feel is luxurious and soft, but not overly thick. It doesn’t feel gross or sticky on the skin, which you might assume with a thick cream like this one. I really like the applicator on this product… about one pump is perfect to cover the face and neck, and the pump makes it easy to control the amount if you want more or less cream. Despite the thick consistency of the cream, it’s really easy to apply and it absorbs into the skin nicely. This is the kind of product that instantly feels like your skin is being hydrated, which I really like! LilyAna Naturals Retinol Cream takes about a minute to dry down on the face, but once it’s dry, it doesn’t leave any residue or sticky feeling. It leaves the face feeling really soft; I was kind of amazed at how soft my face felt after applying this product. There is absolutely no smell to the LilyAna Naturals Retinol Cream. I really appreciate that this product is scent free. I don’t love having scented products on my face. The first few nights after applying LilyAna Naturals Retinol Cream I noticed a difference in the moisture and hydration of my skin. I also noticed that my skin was looking a little bit less red, which I was surprised about seeing results so quickly. Unfortunately, longer term I didn’t notice any big differences outside of the results I saw after a few days. The cream continued to improve my hydration, which did help plump my skin a bit, but overall there wasn’t a big difference in lines or wrinkles. I was happy with the increased hydration and reduced redness but do wish it helped with fine lines and wrinkles more. LilyAna Naturals Retinol Cream contains a lot of ingredients that are known for helping reduce the signs of aging such as hyaluronic acid, green tea, and vitamin e.
Green tea contains polyphenols which are used in many skin care products because they are meant to help fight aging and help make your skin healthy, which is why many people suggest applying green tea under your eyes and face to reduce puffiness and help with aging. Vitamin E has many antioxidants that work to help the skin look more youthful and also contains agents that help block free radicals which can seriously help with antiaging. Hyaluronic Acid is another ingredient to help antiaging by drawing moisture to the skin and help moisturize, which I definitely noticed this product did. 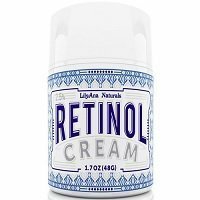 The cost of LilyAna Naturals Retinol Cream is $18.99 for 1.7 oz which comes to $11.17 per oz. This is a pretty average cost for a retinol cream. LilyAna Naturals Retinol Cream unfortunately doesn’t have any money back guarantee. To buy LilyAna Naturals Retinol Cream, click here. Ingredients Hyaluronic acid is great for moisturizing.